To Cite: Tian Q, Shi L, Wu C, Wang J, Wang J, et al. 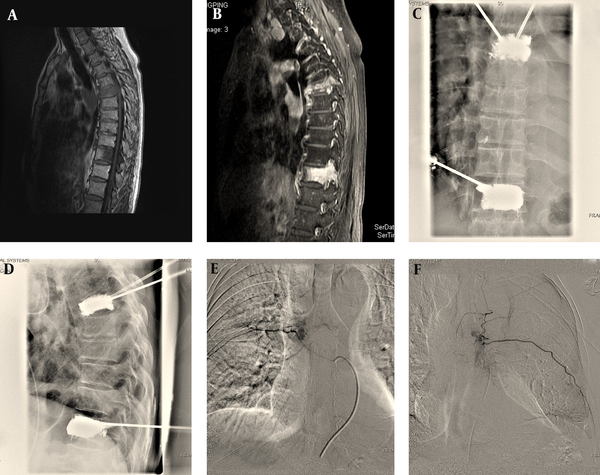 Percutaneous Vertebroplasty Combined with Transcatheter Arterial Infusion/Chemoembolization for the Treatment of Spinal Metastases, Iran J Radiol. 2017 ; 14(3):e13786. doi: 10.5812/iranjradiol.13786. Background: Spinal metastases are the most common type of metastatic bone tumors. Various therapeutic approaches have been used to treat spinal metastases, but traditional treatments are often limited and ineffective. Minimally invasive interventional technology has been successfully performed in the clinical setting. Objectives: This study is designed to evaluate the curative effect of spinal metastases treated by percutaneous vertebroplasty (PVP) and transcatheter arterial infusion/chemoembolization (TAI/TACE). Patients and Methods: A prospective study was performed for 18 consecutive patients with spinal metastases justified by imaging findings and pathology, including 12 men and 6 women, with the mean age of 64.56 ± 11.07 years (range, 50 - 90 years). All patients first underwent PVP and then TAI/TACE. The degree of pain relief was assessed with visual analogue scale (VAS) and WHO standard. The rating of the activity of daily life (ADL) was utilized to evaluate the quality of life. The activities of daily life (ADL) were evaluated with modified Barthel index system. The size of tumor and further bone invasion were evaluated three months after surgery. Results: We achieved a 100% success rate of all interventional operations. The effective rates of pain relief were respectively 94%, 94%, 89%, and 78% for one-day post-op, one-week post-op, one-month post-op, and three-months post-op. VAS for back pain was 7.7 ± 0.8, 5.3 ± 0.6, 3.4 ± 0.8, 2.0 ± 0.6, and 1.5 ± 0.6 for pre-operative, one-day post-op, one-week post-op, one-month post-op, and three-months post-op, respectively. The improvement of VAS was respectively 2.3 ± 0.6, 4.3 ± 0.9, 1.4 ± 0.8, and 1.8 ± 0.7. Preoperative and postoperative 3 months Barthel index was 45.3 ± 12.5 and 85.6 ± 14.2, respectively. There were significant difference in pain relief and the ability of daily life between pre-operation and post-operation time points (P < 0.05). There were no severe clinical or radiographic complications after interventions. Conclusion: PVP combined with TAI/TACE is a safe and effective technique for treatment of spinal metastases. PVP is effective for pain relief but has a limited antitumor effect, while TACE kills tumors more thoroughly compared to PVP. The combination of two therapies can make up for the shortcomings of each other and obtain definite effect, which markedly improves the patients’ living quality. In recent years, with the improvement of survival in most kinds of cancer, the incidence rate of bone metastases also increases gradually. Bone is one of the most frequent metastatic lesions of many tumors. The spine is the most common location of skeletal metastases (1). Spinal metastases may cause serious adverse complications featured by intractable pain, disability, dramatic reduction in the quality of life, and pathological fractures (2). However, there are still a large number of patients suffering from refractory pain resulting from spinal metastases. It is complex and challenging to treat spinal metastases. Conventional therapy includes radiotherapy or surgery, but both of them have inevitable disadvantages. In recent years, with the development of scientific technology, the interventional treatment of spinal metastases has been applied extensively. The objective of this study was to access the efficacy of combination of vertebroplasty and transcatheter arterial infusion/ chemotherapy (TAI/TACE) as a means to treat spinal metastases. Between July 2011 and July 2012, a prospective analysis was performed on 18 consecutive patients with vertebral compression fractures because of metastatic tumors. There were 12 men and 6 women, whose median age was 64.56 ± 11.07 years (range, 50 - 90 years). These patients first underwent percutaneous vertebroplasty (PVP) at 39 different levels in our hospital, then transcatheter arterial infusion/chemoembolization was performed one week later. All the patients were diagnosed by biopsy results and underwent contrast-enhanced MRI (CE-MRI) before the procedure to determine the extent of spinal metastases and the infringement of the spinal cord (Figure 1A and 1B). Primary lesions are summarized in Table 1. The common origins of the primary tumor were the lung and the liver in 33% of cases each, followed by the kidney and prostate in 11%, respectively. Twenty lesions were in the thoracic region, and 19 lesions were in the lumbar region. Fractures occurred between T1 and L5. Fracture distribution is shown in Figure 2. The most commonly involved levels are between T11 and L1. Figure 1. A and B, T1 and contrast-enhanced T1 weighted sagittal MR images show bone metastases on T7 and T12 vertebrae; C and D, Intraoperative images show percutaneous vertebroplasty for T7 and T12 vertebrae; E and F, Intraoperative images show transarterial chemoembolization (TACE) for T7 and T12 metastases. Percutaneous vertebroplasty (PVP) was performed under fluoroscopic guidance (Angiostar; Siemens, Erlangen, Germany), which allowed lateral and anteroposterior views. The patients were placed in the prone position. All procedures were performed under local anesthesia with 2% lidocaine. A 13-gauge needle (Cook, American) was used generally with a transpedicular route for the thoracic and lumbar levels. Bone cement (Smith & Nephew, Inc., Orthopaedic Division, USA was mixed with barium sulfate for radiopaque and then injected under real-time fluoroscopic guidance until it reached the posterior vertebral wall. If a leakage was detected, the injection was stopped. After the procedure, standard lateral and anteroposterior radiographs and CT images were obtained to evaluate the distribution of bone cement and to detect eventual cement leaks. Patients were allowed to stay in bed for 6 hours after the procedure. TAI/TACE: Three days after PVP, TAI/TACE was performed through a femoral artery approach using a 5-Fr sheath after administration of local anesthesia with 2% lidocaine. The tumor-feeding arteries were defined by digital subtraction angiography. Then, a coaxial microcatheter was selectively inserted through the 5-Fr catheter into the tumor-feeding artery. Super-selective angiography of the target tumor arteries was then performed. Before chemoembolization of vertebral metastases, anterior and posterior spinal arteries, especially the Adamkiewicz artery were identified to avoid spinal cord injury during TAI/TACE for the thoracic and upper lumbar spine levels. Therapeutic agents were cisplatin (60 mg) and pharmorubicin (50 mg) for selective chemotherapy, which were dissolved in 40 mL saline and slowly infused into the target-feeding artery at a rate of 4 mL/min. If the tumor staining was very significant, it was then finally permanently embolized with polyvinyl alcohol (PVA) particles of proper sizes. Dexamethasone and mannitol were applied for three days to relieve edema. Visual analogue scale (VAS) was used to access the change of the pain before PVP, of which scores range from 1 (no pain) to 10 (excruciating pain). The follow-up data were collected at pre-operation, one-day post-operation, 1 week, 1 month and 3 months after operation. Pain relief was assessed with WHO standard, which is classified into no relief, mild relief, partial relief (PR), and complete relief (CR). Of which, partial relief and complete relief are considered to be effective, so the effective rates of pain relief are defined as the percentage of the number of partial and complete pain relief accounting for the total patients (PR+CR/the total). The improvement of VAS, which is also called VAS difference, is calculated by only subtracting the VAS after PVP from the VAS before PVP. The ratings of the activity of daily life (ADL) was utilized to evaluate the quality of life. ADL are the fundamental activities a person needs to live independently. They include bathing, eating, moving bed or chair, personal care, dressing, toileting, bladder management, bowel management, moving up/down stairs, and walking horizontally for 50 m. The Barthel index (BI) is used to assess actual performance of activities of daily living (ADL). CT scan was supposed to be taken at 3 months aiming to observe the possibility of recurrence. All statistical analyses were performed using SPSS 13.0 (SPSS Inc., Chicago, IL). Data were recorded as average ± SD. The normality of data was assessed by ANOVA homogeneity test. The repeated measure ANOVA was used for quantitative data. Multiple comparisons between the groups were performed using least significant difference (LSD) method. P < 0.05 was considered statistically significant. We achieved a 100% success rate of all the interventional operations (Figure 1C- F). There were no severe clinical or radiographic complications after interventions. There were no further bone invasion and soft tissue mass increasing three months after operation. Although the time interval of three months is short, it still can control the growth of tumor by obstructing the blood supply of the tumor and further bone invasion. The preoperative VAS was 7.7 ± 0.8, and it was reduced to 5.3 ± 0.6 at postoperative first day, 3.4±0.8 at post-op first week, 2.0 ± 0.6 at post-op first month, and 1.5 ± 0.6 at post-op third month. The improvement of VAS is respectively 2.3 ± 0.6, 4.3 ± 0.6, 5.4 ± 0.7, and 6.0 ± 0.8 (Figure 3). The difference in the VAS was statistically significant between pre-op and 1 day post-op (P = 0.002), the difference in the VAS was statistically significant between pre-op and 1 week post-op (P = 0.014). The difference in the VAS was statistically significant between 1 day post-op and 1 week post-op (P = 0.025), which suggests that pain has further improved. The difference in the VAS was statistically significant between 1 month post-op and 1 week post-op (P = 0.001), which suggests that pain improved after PVP combined with TAI/TACE. The difference in the VAS was statistically significant between 3 months post-op and 1w post-op (P = 0.003), which suggests pain relief persisted within 3 months. The difference in the VAS become statistically significant between 1m post-op and 3m post-op (P = 0.018), which suggests that pain further improved after PVP combined with TAI/TACE. 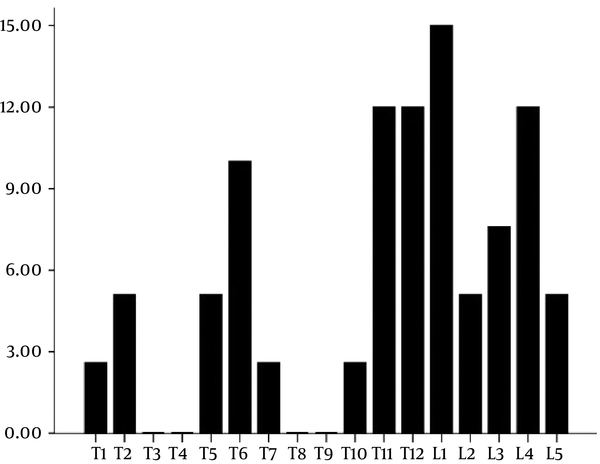 All patients exhibited excellent improvement of pain as time went on, but the speed of descending is slightly slow from one month to three months (Figure 3). The effective rates of pain relief 1 day, 1 week, 1 month and 3 months post-operation were 94% (17/18), 94% (17/18), 89% (16/18), and 78%(14/18), respectively. The activities of daily life (ADL) were evaluated with modified Barthel index system. Preoperative and postoperative 3 months Barthel index was 45.3 ± 12.5 and 85.6 ± 14.2, respectively. There was significant difference in the ability of daily life (P < 0.05). Other than the lung and the liver, the skeletal system, especially the spine, is the third most frequently involved organ by metastases (3). With a worldwide increase of malignant tumor incidence and to a longer survival time of patients with cancer, a rise in the incidence of bone metastases is observed (4-7). The location of predilection is the thoracic vertebrae (60% to 80%), followed by the lumbar vertebrae (15% to 30%), and finally the cervical vertebrae (less than 10%) (8). Spinal metastases are most often observed in patients with cancer of the breast, lung, liver, and prostate (8, 9). The clinical features of spinal metastases range from asymptomatic lesions to radicular pain, pathologic fractures, disability, and sensory deficits caused by radicular, spinal cord damage (10). Various therapies have been used for treatment of spinal metastases, including bed rest, pain killers, radiation therapy, chemotherapy, and/or surgery (11-13). However, conservative measures, such as bracing and pain medications always have limited pain control (14). Pain relief from radiation therapy is not always complete and often delayed. Due to the limited life expectancy and the generally poor condition, surgery is not a better option in these patients. There are many reports about interventional treatment of spinal metastases in the literature. Vertebroplasty or TACE are common means of treatment. PVP has been widely used as a minimal invasive treatment of metastases and has achieved satisfactory therapeutic effects (15, 16). Currently, pain relief is the mainly evaluation of the treatment efficacy of vertebroplasty on spinal metastases, which mostly result from tumor necrosis, increased spine consolidation and destruction of sensory nerve endings. Polymethyl methacrylate (PMMA) not only has antitumor effects but also acts as an analgesic. Space-occupying effects from bone cement block tumor cell growth. Heat and cytotoxic effects during PMMA polymerization are the main factors that destroy tumor feeding arteries and small nerve fibers and lead to tumor necrosis (17). In our study, the mean VAS was respectively 7.7 ± 0.8, 5.3 ± 0.6, 3.4 ± 0.8, 2.0 ± 0.6, and 1.5 ± 0.6 at pre-operative, 1-day, 1-week, 1-month, 3-months post-operative time points, which showed a considerable improvement in pain between the pre- and post-operative time points (Figure 3). Our results are in accordance with those previously published in the literature as regards to the analgesic efficacy of PVP for this indication (18). 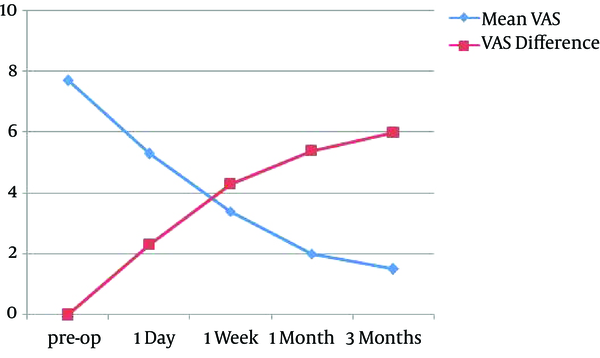 The analgesic effect also persisted after PVP throughout the 3-month follow-up period. Cortet et al. reported that PVP achieves an immediate and long time analgesic effect persisting for at least 6 months (19). However, PVP also has a limited antitumor effect due to limited and incomplete antitumor effect. Feldman et al. first reported the use of selective arterial embolization for treating bone tumors in 1975 (20). Arterial embolization was initially performed preoperatively to reduce bleeding surgery. It has been then used as a treatment for various kinds of tumors, which are invalid to conventional treatments. By increasing the local concentration of chemotherapeutic agents, prolonging the action time, and reduction of tumor blood supply, the growth of the tumor was inhibited. By shrinking the size of the tumor, which resulted in nerve root or spinal cord compression, pain relief is achieved (21). Some authors have demonstrated that chemoembolization alone may significantly alleviate pain resulting from bone metastases (21-25). The pain relief begins several hours or days after embolization. Pain relief may result from decreased pressure on the periosteum and tumor shrinkage (21). Although vertebroplasty or transarterial chemoembolization alone caused pain relief and antitumor effects, each treatment has different emphasis and mechanism. For pain relief, PVP depends on PMMA to increase spine stability and heat effect to destruct sensory nerve ending. As for transarterial embolization, pain relief may result from tumor shrinkage and decreased pressure on the periosteum. If soft tissue mass is not evident, the effect may not be significant. For antitumor effects, in terms of PVP, space-occupying cement blocks tumor cell growth, as well as cytotoxic and chemical effects of PMMA polymerization. But it has a limited antitumor effect, the distribution of PMMA is not uniform, where PMMA does not disseminate, the remaining tumors will not be killed. While transarterial chemoembolization can obstruct blood supply of the tumor to make tumor ischemia and necrosis, and directly transport chemotherapy drugs to inside the tumors to kill tumor cells. In this way, transarterial chemoembolization kills tumors more thoroughly compared to PVP. For patients with bone metastases, pain relief and improvement of the quality of life is considerably not easy in such limited life span. People always die of all kinds of complications, so we seek to use the combination of PVP and TAI/TACE to make people have a high quality of life in the limited life span. To our knowledge, there are no reports about PVP combined with transarterial chemoembolization in English literature so far. In China, there are few reports about the combination of two therapies. He et al. think that TACE plus PVP is an effective and safe procedure in the treatment of severe painful vertebral and paravertebral metastatic tumors (26). In this study, the improvement of VAS is respectively 1.4 ± 0.8, 1.8 ± 0.7 at post-operative 1 month, and 3 months. The difference in the VAS was statistically significant between 1m post-op and 1w post-op, which suggests that pain improved after PVP combined with TAI/TACE. The difference in the VAS was statistically significant between 3 m post-op and 1w post-op, which suggests pain relief persisted within 3 months. The difference in the VAS was statistically significant between 1m post-op and 3 m post-op, which suggests that pain further improved after PVP combined with TAI/TACE. The results demonstrated that the combination of PVP and TACE has a definite analgesic effect in treating spinal metastasis. At the same time, preoperative and postoperative 3 months Barthel index was 45.3 ± 12.5 and 85.6 ± 14.2, respectively, indicating that the ability of daily life for patients improved to a great extent. There were no further bone invasion and soft tissue mass increasing on 3months post-operative CT scan, which suggests that the tumor had no recurrence. Our study had some limitations. First of all, the small sample size made the data inconvincible. Second, the rapid progression of disease and the relatively short time follow-up could mask both benefits and risks of this treatment. In fact, intraarterial chemotherapy could have little effect in the quality of life and pain relief in short term. Third, the limitation relates to the limited number of CT scan and MR images, available to us. Ideally, it would be better to have both types of images available for every patient to better judge the degree of bone destruction. In addition, we did not have a control group for example PVP only or TAI/TACE only to compare the results. A control group with a larger sample size may be more meaningful. However, our study can serve as a scaffold for the design of future researches. In conclusion, PVP combined with TAI/TACE is a safe and effective technique for treatment of spinal metastases. PVP is effective for pain relief but has a limited antitumor effect, while TACE kills tumors more thoroughly compared to PVP. The combination of two therapies can make up for the shortcomings of each other and obtain definite effect, which markedly improves the living quality of patients. Li-Na Shi developed the original idea and the protocol, abstracted and analyzed data, and is guarantor. Qing-Hua Tian wrote the manuscript. Chun-Gen Wu, Jue-Wang, Jian-Bo Wang and Ying-Sheng Cheng contributed to the development of the protocol. Funding/Support: This study was sponsored by grant 17YF1414600 from Shanghai Sailing program, grant 1455 from the Shanghai Jiao Tong University Affiliated Sixth People’s Hospital and 2016014 from the Shanghai Jiao Tong University Affiliated Sixth People’s Hospital East Campus, China.